The original no-bake cheesecake, a fast and easy alternative to baked cheesecake, was introduced in the 1950s as Cherry-O Cheese Pie. Today, this creamy and flavorful no-bake cheesecake is still a favorite for family and friends. The difference between no-bake and baked cheesecake is in the ingredients. 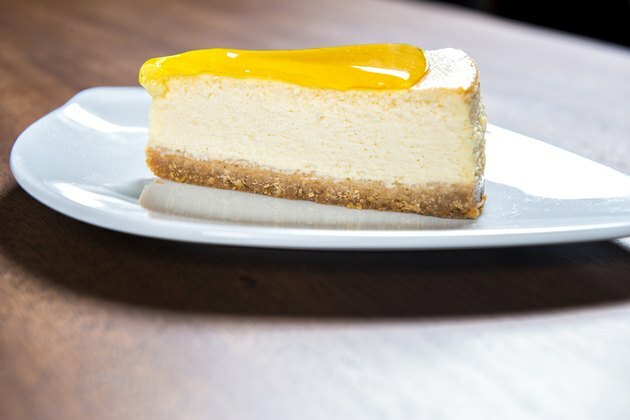 While baked varieties use eggs and flour as thickeners, no-bake cheesecakes use condensed milk and lemon juice to thicken them, eliminating problems such as over-baking and cracking. Sweetened condensed milk provides sweetness and creaminess to no-bake cheesecake and also acts as a thickening agent for the cream cheese. Sweetened condensed milk, made from evaporated milk and sugar, thickens without the use of heat when blended with a fruit acid such as lemon juice. This means you don't need to bake it to thicken it. No-bake cheesecake recipes call for one can or 1 1/4 cups of sweetened condensed milk for every 1/3 cup of lemon juice. Graham cracker crust, the base for a no-bake cheesecake is the easiest of all crusts to make. All it takes is sugar, butter and graham cracker crumbs -- or whole graham crackers crushed in a plastic bag with a rolling pin. Once the crust is pressed into a tart pan it will set in the refrigerator for approximately 10 minutes. If you prefer, buy a ready-made graham cracker crust from the frozen food section at the grocery store. No-bake cheesecake requires little preparation, making it a simpler alternative to baked cheesecake. Creamy cheese cake begins with softened cream cheese beaten until fluffy. To that, you add the sweetened condensed milk, lemon juice and flavorings. Once you've beaten it and poured it into the crust, there's not much more to do other than put it in the refrigerator and wait. It will take the cheesecake about three hours to set before you can top it with fruit or other toppings and serve it. Create a lower-fat version of the no-bake cheesecake by substituting the full-fat sweetened condensed milk with the same amount of low-fat or fat-free sweetened condensed milk and use low-fat or fat-free cream cheese. Replace the butter in the graham cracker crust with melted low-fat spread.